Blizzard has put together a list of all the changes to the auction house for 1.04. The changes are listed below. - Players can now cancel their auctions at any point so long they do not have any active bids on them (it will still take five minutes for a listed auction to become searchable, however). - We've increased the maximum stack size of gold per listing from 100,000 to 1,000,000. The current minimum listing price will remain the same per stack. - We've added description text to several error messages. We've also improved several existing descriptions so that they more clearly describe why you've encountered an error. - We're upping the allowed number of "Preferred Stats" per search from 3 to 6. - We're upping the number of digits you can enter in the "Min Value" field for equipment searches from 3 to 5 (i.e. you can now search for values > 999). - We've replaced “Minimum Damage” with “Average Damage” as a searchable stat, which can be calculated as follows: (Min Damage + Max Damage) / 2. So, for example, searching for an Average Damage of 12 will find an item with 10-14 damage, 12 Minimum damage, or 24 Maximum damage. - Stat increases which come from slotted gems will no longer be factored in when searching for equipment. 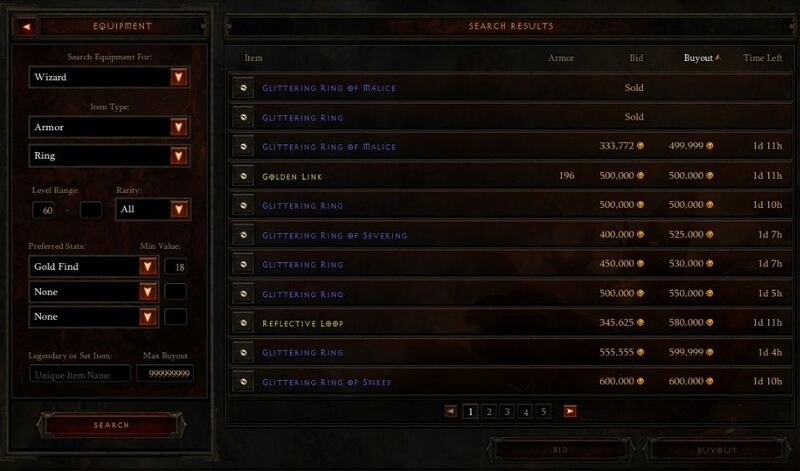 Instead, your search criteria will only take into account the base stat values for an item. - Armor, DPS, Buyout, and Time Left columns are now sortable columns in the Search tab. - The Auctions tab and Completed tab will now refresh whenever one of your items has been purchased. - Whenever an auction expires or is cancelled, the listing price of that item will now display in the Completed tab. - Tooltips have been added for items in the Completed tab (which means you'll be able to see the stats of the items you've purchased or sold, as well as items which failed to sell or were cancelled). - Tooltips have been added for commodities. 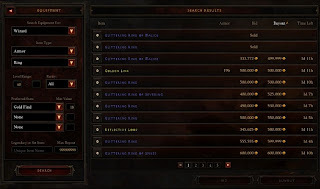 - Item Compare tooltips have been added to the Recommended Items page. In addition to these improvements, we're also fixing several bugs with the auction house UI and functionality (many of which you reported on these forums). - Auction house filters are no longer case-sensitive. - Players can now search for stats on Legendary items! Yay! - The Recommended Items page will now display quivers for demon hunters even if you have a two-handed ranged weapon equipped. - Witch doctor's Corpse Spider bonus is now listed when searching for mojos. Searches will now properly filter results according to the set Minimum and Maximum values for"Life per Spirit Spent"
*Blizzard also says there will be additional changes for the patch 1.10 also regarding AH. Created and also presenting your amazing calendario de futbol put money, You juegos de futbol are investing buy until this goods from the vendor if Maglie Da Calcio a Poco Prezzo you are the getting prospective buyer. You might have Maillot De Foot Pas Cher examined and consented to resultados de futbol the world sending maillot foot 2018 software procedure conditions and terms unwraps in a totally new door npotentially bill. Transfer rates prior to maillot de foot personnalise now offered continue to be cause to undergo change any time you ones the highest level of put money on serving.